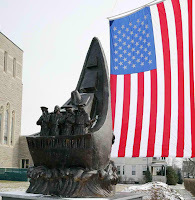 As we commemorated the seventieth anniversary of the sinking of the USAT Dorchester on February 3rd, 2013. One cannot help but think of the great sacrifice these four chaplains displayed "so that others may live" It's no wonder why the Ancient Accepted Scottish Rite, NMJ choose to make this portrayal as one of its core value degrees namely the 23rd degree. The Four Chaplains story has a closer connection to New Jersey than one might know. Two of the Four Chaplains have close ties to this state. The Rev. Clark V. Poling & Father John P. Washington. Jersey. He attended Seton Hall University where he majored in theology in 1933 and was ordained in 1935. Father Washington belonged to several parishes in New Jersey before settling at The Church of Saint Stephen in Kearny, NJ. Both men served their respective congregations with distinction and dedication, and both men along with Rabbi Alexander D.Goode and Rev George L. Fox, would enlist in the armed services when their country needed them most. They embarked upon the USAT Dorchester in New York City, harbor on January 23, 1943. During the early morning hours of February 3, 1943 around 1:00 AM, The Dorchester was hit by a torpedo from the German submarine U-233. If you can imagine the cold dark waters of the North Atlantic coupled with panic and not enough life jackets, knowing full well they were going down with no help in sight, and knowing full well that a U-boat was still lurking in the waters perched like a hawk waiting to strike again on them, or anyone coming to their rescue. However despite these horrific conditions and almost certain death. 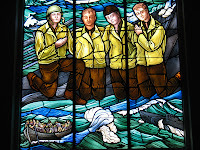 These four brave men assisted the crew by keeping them calm and organized, and when it was apparent that life jackets were in short supply, they without hesitation gave their own life jackets to those whom they believed needed them more. As stated by one of those who bared witness to this magnificent act of courage and valor for their fellow comrades. "As I swam away from the ship, I looked back. The flares had lighted everything. The bow came up high and she slid under. The last thing I saw, the Four Chaplains were up there praying for the safety of the men. They had done everything they could. I did not see them again. 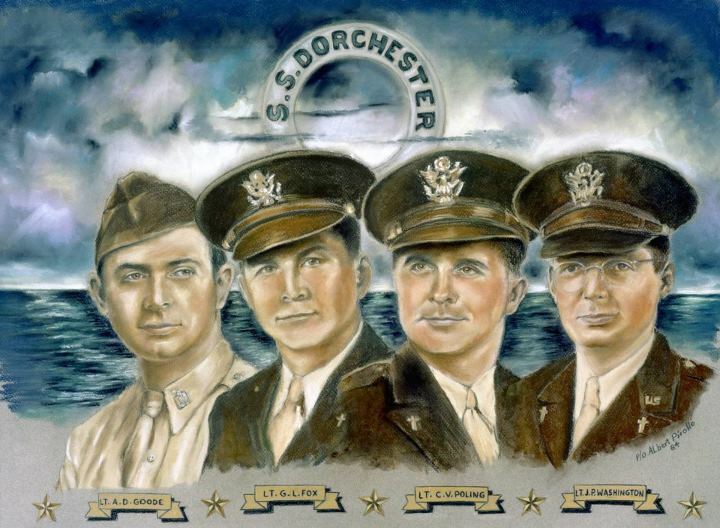 They themselves did not have a chance without their life jackets"
These brave men were awarded the Purple Heart & Distinguished Service Cross posthumously on December 19, 1944. Then in 1960 Congress voted for the creation of the Four Chaplains Medal intended to have the same weight and importance as the Medal of Honor. These again were also awarded posthumously to the next of kin for each of the Four Chaplains on January 18, 1961. 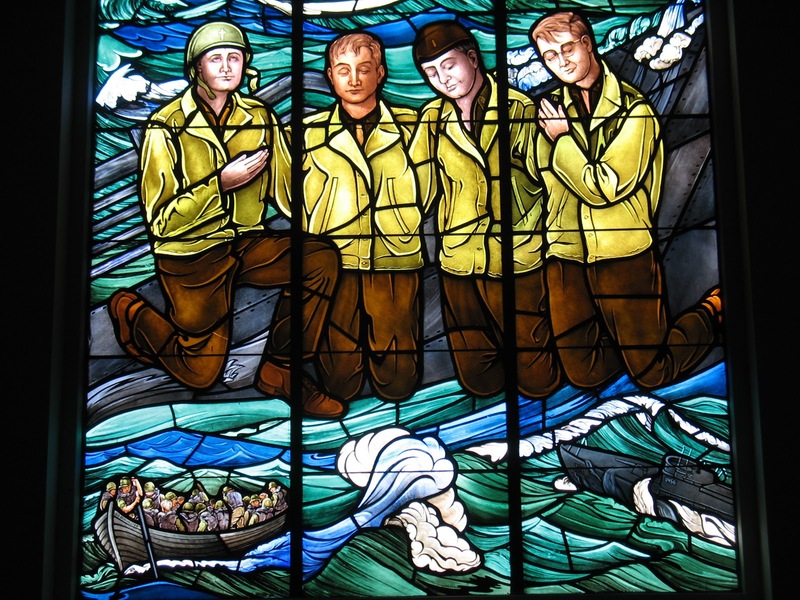 Many memorials, foundations and stained glass windows have been erected to commemorate their heroic valor. Well now New Jersey can also claim that same distinction. This past February 3, 2013 a wonderful and magnificent bronze monument was unveiled for the first time amongst a large crowd at the Church of Saint Stephen in Kearny, NJ. This was the same church that Father Washington had been a curate in just before the war. 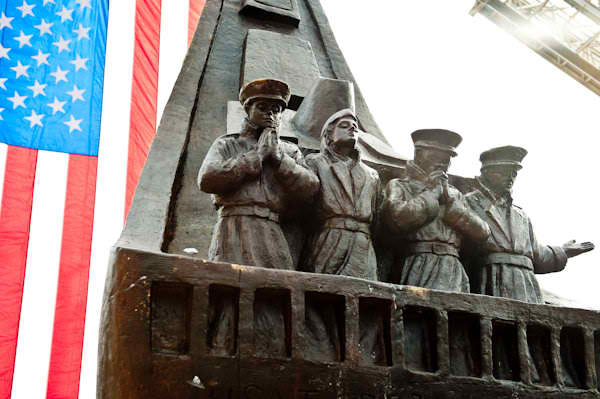 Its a beautiful 11 foot bronze statue depicting the Four Chaplains holding hands in the bow of the ship. A monument I encourage you all to visit! I must admit that I had never heard about these four men and their gallantry until I witnessed the 23rd degree for the first time back in 2008. This left me speechless and very eager to see what else this great fraternity had to offer. Brethren its true the Scottish Rite, NMJ has changed, along with its rituals, and many might say this is very detrimental to the Rite. We've also heard much of our Southern counterpart ILL Albert Pike. 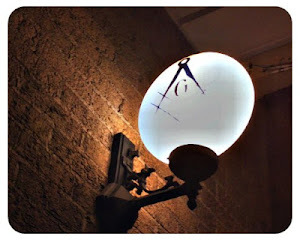 Now theres no doubt that Pike's contribution to the Scottish Rite, and Freemasonry as a whole is invaluable when it comes to the ritual with its many wonderful allegories and themes, along with establishing the Rite as we know it today. However lets not completely shun the wonderful degrees of the NMJ. Yes we have changed several of them, and many may argue that we are losing the core value or essence of what they have characteristically been known for. However I say what can be further from the truth! What could be more evident? Although many of our degrees have depicted mythical characters of ages past. Many of the degrees today depict current or real events of our unique history. When you recount the George Washington Degree, Friend to Friend, Brothers of the Forest or most recently the Four Chaplains degree. How can we say that courage, duty, honor, bravery and brotherly love not meet the core values or serve to inspire us in everyday life. Brethren sometimes change is good! We all must change and adapt with the times if we'er to survive and continue to grow. We all cant help to feel a sense of duty, honor and brotherly love upon seeing the Four Chaplains degree, this is the true and awe inspiring message which Freemasonry conveys. Surely this is the Rite stuff! 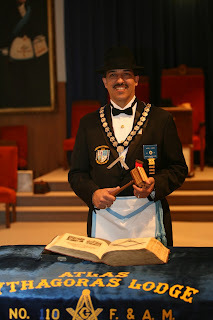 WB Moises I Gomez is Past Master of Atlas Pythagoras Lodge No. 10, Westfield, New Jersey. Current Most Wise Master of the Rose Croix line Valley of Northern New Jersey. Eminent Commander of Trinity Commandery No. 17 and all York Rite bodies. S.R.I.C.F. college of NJ, Recorder of St. John's Conclave Red Cross of Constantine. Senior Warden of Vorrhis Council No. 260 AMD, Masonic Kilties of NJ.Member of Athelstan and Operatives. Excellent piece! Thanks for sharing it with us! What a remarkable story. Thank you.